The best, easiest, and cheapest upgrade you can make to any computer is to add more memory. The process isn’t that difficult, yet the benefits are seen immediately: Programs run better and everything goes more smoothly, thanks to all that roomy RAM. To see how much memory lurks in your Windows PC, press the Win+Break keyboard shortcut. (The Break key is shared with the Pause key, which is how it might be labeled on your PC’s keyboard.) What you see is the System window, similar to what’s shown in Figure 1. The memory quantity is highlighted in the figure. Figure 1. The System dialog box, with current installed memory (RAM) highlighted. 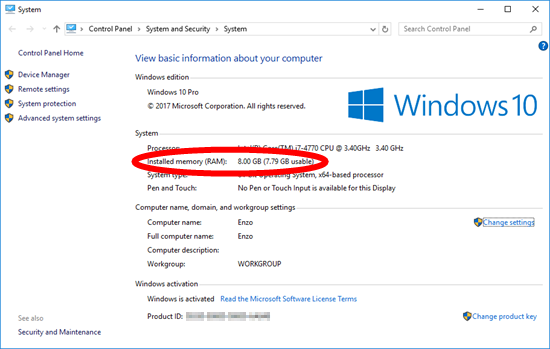 A typical PC sold today comes with 4GB RAM minimum, which is what Windows 10 craves — at a minimum. Windows 10 really needs 8GB to run well. From Figure 1, the PC (my test system, Enzo) has 8GB of RAM installed. It would benefit tremendously from 16GB, which makes sense. What may be unclear, however, is how to add that memory. My son posed this question to me from his college dorm room. He phoned while looking inside his PC case, which I thought was a bold move. “You’ve unplugged the thing, right?” I asked. Of course, he did. He needed more memory to better run his games (a vital part of a university education). So his thought was to look inside and see which chips were installed and then to buy more of those chips. That process works for potato chips, but not RAM. Despite his logical approach, no standard is established for labeling computer memory. The numbers on the chips mean something to the manufacturer, but little to anyone else. Even then, that manufacturer may not make those specific chips any longer. So the numbers are useless. No, the two main things you must know are the type of memory to install and how much you need. The motherboard prefers a certain type of memory at a specific speed. Without a match, the memory upgrade won’t work. The quantity of memory depends on how much you want as well as what’s already installed. If the motherboard features four slots for SIMM cards and all four are full, you must replace existing memory completely with the new quantity. Yes, that’s wasteful, but it’s how many computer dealers save money when RAM is initially installed. Better is when some SIMM slots are empty, but even then you may need to purchase the whole gamut of RAM to update the system. I told my lad the same advice I give in my books: Go to crucial.com and run their Crucial System Scanner. This program (safe to run) tells you what’s needed to upgrade your RAM. You can buy the chips from Crucial directly or use the details provided to shop elsewhere. The physical part of upgrading isn’t that difficult. Details are presented in my book, Troubleshooting & Maintaining Your PC All-in-one For Dummies, as well as my courses available online at LinkedIn Learning.